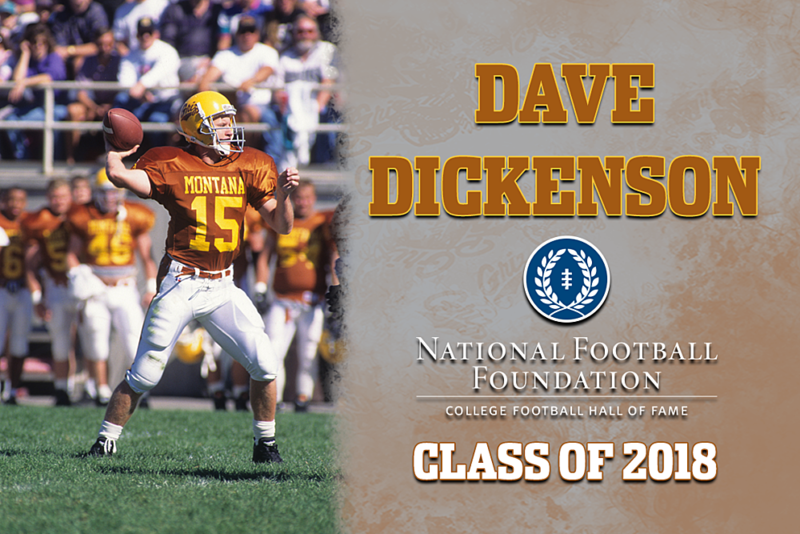 The University of Montana and The National Football Foundation (NFF) & College Hall of Fame announced today that they will jointly honor 2018 electee Dave Dickenson with an NFF Hall of Fame On-Campus Salute, presented by Fidelity Investments. The Salute will take place this Saturday, Sept. 22, between the first and second quarter of the Grizzlies’ game against Sacramento State. The team will also honor Dickenson by wearing throwback copper and gold uniforms against the Hornets. Coverage of the game will start at 1 p.m. MT on ROOT Sports/Audience Network. The NFF Hall of Fame On-Campus Salute program, which began with the inaugural College Football Hall of Fame Class in 1951, has become a hallowed tradition, and to this day the singular events remain the first of numerous activities in each inductee’s Hall of Fame experience. During the NFF Hall of Fame On-Campus Salutes, each inductee returns to his alma mater or college to accept a Hall of Fame plaque that will remain on permanent display at the institution. The events take place on the field during a home game, and many inductees cite the experience as the ultimate capstone to their careers, providing them one more chance to take the field and hear the crowd roar their name. A two-time First Team All-American, Dickenson remains the Grizzlies’ all-time leading passer and still holds 28 other school records. The recipient of the 1995 Walter Payton Award as the top player in the FCS, Dickenson led Montana to the FCS national title that year. In the championship game, he orchestrated a 12-play, 72-yard scoring drive that culminated with the game-winning field goal as part of a come-from-behind win over Marshall. In four playoff games in 1995, Dickenson threw for 1,500 yards and 13 touchdowns, bringing his totals at the end of the season to 5,676 and 51, respectively. Although the NCAA did not recognize playoff statistics at the time, he completed the regular season with a school- and then-Big Sky Conference single-season record 4,176 passing yards. Dickenson’s 379.6 yards per game in 1995 rank fifth all-time in FCS history and still stand as a school and conference record. His record-setting senior season also extended off the field where he was named an NFF National Scholar-Athlete and earned his third consecutive Academic All-America honors. The three-time First Team All-Big Sky selection and Big Sky Offensive MVP led the Grizzlies to conference titles in 1993 and 1995, and he led the FCS in passing yards per game as a junior and senior. Dickenson finished third for the Walter Payton Award in 1994 and was an Honorable Mention All-American in 1993 after leading the team to the playoffs in both seasons. A three-time team MVP, his school-record 11,080 career passing yards are sixth in conference history, and his 33 career wins remain a program best. A member of the University of Montana’s Grizzly Athletics Hall of Fame, Dickenson’s No. 15 jersey is one of only two retired jerseys at the school. After college, Dickenson played professionally for 12 seasons, most notably in the Canadian Football League for the Calgary Stampeders (1997-2000, 2008) and the BC Lions (2003-07). The 2015 CFL Hall of Fame inductee was the league’s MVP in 2000, and he won three Grey Cups (1998, 2006, 2008). Dickenson spent the 2001 and 2002 seasons in the NFL with the San Diego Chargers, Seattle Seahawks, Miami Dolphins and Detroit Lions. After seven years as an assistant coach, Dickenson has served as head coach of the Calgary Stampeders since 2016, leading the team to two Grey Cup appearances in as many seasons and earning coach of the year honors after his first campaign. Active in the community, Dickenson is heavily involved with the Special Olympics in Alberta, Canada, and supports the Calgary Urban Project Society. A member of the Montana High School Association Athletic and State of Montana Football halls of fame, he was named the Big Sky Conference’s greatest-ever male athlete in 2013. Dickenson joins Bill Kelly (1924-26) as the only two Grizzly players in the Hall. Former Montana coach Bernie Bierman (1919-21) is also enshrined in Atlanta. Including the 2018 class, only 997 players and 217 coaches have been inducted into the College Football Hall of Fame from the nearly 5.33 million people who have played or coached the game over the past 149 years. In other words, less than two one-hundredths of a percent (.02%) of those who have set foot on the gridiron have earned the distinction. Click here for a complete list of players and coaches in the Hall. The 2018 College Football Hall of Fame Class will be officially inducted during the 61st NFF Annual Awards Dinner at the New York Hilton Midtown on Tuesday, Dec. 4. This year’s College Football Hall of Fame Class includes: Trevor Cobb (Rice), Kerry Collins (Penn State), Dave Dickenson (Montana), Dana Howard (Illinois), Calvin Johnson (Georgia Tech), Paul Palmer (Temple), Ed Reed (Miami [Fla.]), Matt Stinchcomb (Georgia), Aaron Taylor (Nebraska), Charles Woodson (Michigan) and coaches Frank Beamer (Murray State, Virginia Tech), Mack Brown (Appalachian State, Tulane, North Carolina, Texas) and Mel Tjeerdsma (Austin College [Texas], Northwest Missouri State). For more information on the Dinner, please contact Will Rudd at wrudd@footballfoundation.com or by calling 972.556.1000. The 2018 Class will also be forever immortalized at the Chick-fil-A College Football Hall of Fame in Atlanta. Grizzly Athletics will host a press conference with Dickenson and NFF Chief Operating Officer Matthew Sign on Friday, September 21, at 3 p.m. The press conference will be broadcast live on the official Twitter feed of Grizzly Football @MontanaGrizFB. The 2018 season marks the ninth season that Fidelity Investments, a leading provider of workplace savings plans in higher education, is serving as the national presenting sponsor of the NFF Hall of Fame On-Campus Salutes. The salutes are one component of a multi-year initiative between the two organizations to celebrate the scholar-athlete ideal and a joint commitment to higher education. Fidelity is a partner of The William V. Campbell Trophy®, college football’s premier scholar-athlete award, and the NFF National Scholar-Athlete Awards. Fidelity also helped launch the NFF Faculty Salutes in 2011, which recognizes the contributions of the faculty athletics representatives around the country.